Well I was going to post something to the effect that Charles Johnson's LGF has completely jumped the shark, but it occurred to me that it had probably already had been done by now. I used to link to LGF, until something happened over there -- and I'm still not certain what it was. 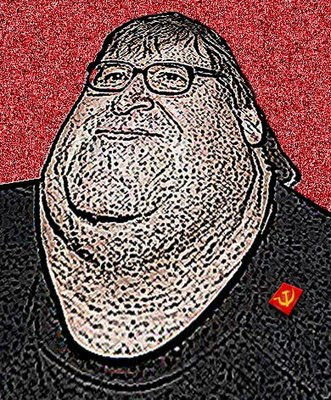 I still visit,read it, and agree with a lot of LGF, but I'm just about convinced that CJ's biggest problem is he's far more afraid of fringe Christianists and wacko conspiracy theorists (there's a Venn diagram to those categories) than he is of the actual funded, organized and radical socialist/fascist agenda being played out in right in front of him. In the past couple of weeks, it has become even weirder over there. The most bizarre is an attempt to lowball the headcount at the 9/12 march in Washington DC. While mocking the ridiculously high 2 million marcher count, LGF in bizzare fashion pushes for the equally ridiculous low end of the estimates. In addition, while posting and linking to every photo of marginal hangers-on (and possible Mobys) at the march, LGF has studiously avoided significant coverage of the majority at the march - a majority clearly shown at other sites. A 'Brand' upon which you can rely through good times and bad. Hmmmm. 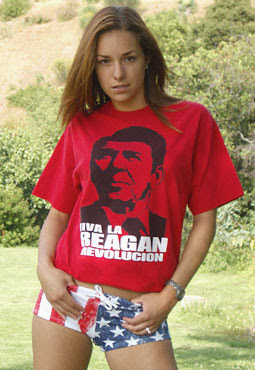 Remember the recent calls by some morons to 'get over' Reagan? (click here to shop for your own shirt). In the face of a blatent attempt to 'reframe' our perception of what 9/11 is all about and what it should be remembered for, Bill Whittle at PJTV heads up today's Trifecta with Scott Ott and Stephen Green. Within they cogently remind us why no reframing is required. I am somewhat saddened by the need to state the obvious these days, but for the most part I'm just p***ed off. I'm talkin' to you Obamabots.... I got yer' National Day of Service hangin'. No Michael. But I think you and your ilk are evil. A stupid, vain, pinhead form of evil, but evil none the less. The best way to deal with this kind of evil is to mock it, and point out just how stupid it is. Now, I'm sure Mr. Moore takes great care to NOT encounter people who are in a position to point out his stupidity, but there must be a couple of people he deals with on any given day who 1. recognizes him and 2. are not dependent upon his good graces for their livelihoods. So... if any of you happen to run into Mr. Moore, please point at his pathetic self and laugh at him for me will you? I'd do the same for you. I thank you in advance. P.S. Lance Fairchok at American Thinker has a timely post that illustrates quite clearly why the stupidity of the Left must not stand. Excellent! Bill Whittle at PJTV takes the President and the Pissant (Bill Maher) to school on American Exceptionalism, and does so hitting 3 of the 6 Elements of Power in proving his point via Military, Economic, Scientific and Cultural examples. I believe his 'Scientific' examples have roots in the Cultural, Demographic, Organizational, Military and perhaps even Geographic Elements of Power (but that probably would have made the video too long).